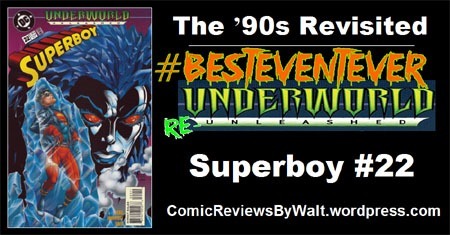 The ’90s Revisited: Superboy #22 – Underworld Unleashed! It seems I’ve picked a whole bunch of "cold" issues for covering Underworld Unleashed! Mr. Freeze over in Green Lantern #68 and Batman #525, Luthor and Joker in a snowglobe over in Superman: The Man of Tomorrow #3…and now Killer Frost in this issue! The issue opens with Superboy popping back into the present in amazement after some sort of time-travel adventure (apparently a crossover between the previous issue, Legion [of Super-Heroes?] #74, and Legionnaires #34, according to the Editor’s Note). He heads home only to be ambushed by Knockout, who has decided she’s living "here now" to Superboy’s consternation. Meanwhile, a plane crashes into the airport, apparently brought down due to being "all iced up!" An ice-woman emerges, seeking warmth, saying "…Neron said he’d make me more powerful, but i’m just as I always was…need to absorb more heat…" We then return to Superboy and a rather perturbed Rex Leech lamenting damage to the house, though he hadn’t noticed Knockout being in the process of cleaning up the mess she’d made. While Superboy, Knockout, Dubbilex, and Roxy Leech chat, it begins to snow…which is quite surprising considering their Hawaii environment! Superboy and Knockout wind up in town facing off with the ice-woman, who–based on MO–seems to be Killer Frost. With Tana Moon nearby observing, they manage to stall Frost with a bit of volcanic heat…before Knockout drops a truckload of liquid oxygen on the Neron-enhanced villainess. Losing sight of both, Superboy worries about Knockout before she emerges and steals a kiss, joyful over the fun of the day (said kiss making Tana jealous, and leading Superboy to affirm his feelings for her and that Knockout is not his interest). Meanwhile, Neron appears to Knockout and offers her her heart’s desire…she violently refuses and Neron leaves. Also meanwhile, Roxy makes it slightly belatedly to a "meeting" she was worried about, and we see that she’s taking a police exam, which has implications for the future. First off, while Neron does appear (briefly!) in this issue, it’s more of a cameo, lasting barely a single page. Second, we’re not given much of anything on Killer Frost…she’s anything BUT 3-dimensional here, just a name and power; nothing to do with who she is, any background, any real or in-depth motivation (she thought Neron was helping her, but she still needs warmth.) Lacking motivation, she’s nothing but a plot device, serving as a shoe-horned-in element to try to justify this issue "tying in" to Underworld Unleashed for the month. Though the cover gives us Killer Frost’s face and a frozen Superboy…that’s misleading, giving an appearance of personal, intentional malice on her part and having more impact on Superboy than she actually does. The issue really seems to belong to Knockout trying to establish–or re-establish–a teamup with Superboy and showing (perhaps) a bit of responsibility on her part. I remember seeing the character on covers, and I’m pretty sure I remember her being an antagonist for Superboy in the earliest issues of this series–maybe as early as the first or second issue. I don’t remember much of anything about her or her arc, but she seems like the "annoying tag-along spanner-in-the-works" here, disrupting Superboy’s life, public and private. She reminds me quite a bit of Maxima in some of her early appearances in the Superman titles in the late-’80s/early-’90s, serving at once as an antagonist while showing lustful interest in our hero that is not reciprocated, and yet not being "all-bad." As said, Killer Frost is basically incidental here, interchangeable with any other character that causes/controls cold, or even any NEW character with such a power set. I only even really know the name "Killer Frost" thanks to the CW Flash tv series…without that, I wouldn’t know the character existed prior to this issue and might have assumed she was some throw-away character introduced in the main Underworld Unleashed mini-series or an earlier issue of Superboy or some such (Killer Frost was actually introduced in Firestorm in the late 1970s). I’m not overly familiar with this period of the Superboy series, losing track of the title after its first several issues in 1994. I remember Rex and Roxy from the character’s earliest days in Adventures of Superman, during Reign of the Supermen, and that along with Dubbilex and Tana Moon, they wound up in Hawaii with Superboy. I also remember Roxy seeming like a complete, dumb airhead or such…but here, I see that she’s been making changes and the simple fact of her taking the police exam shows me that she is anything BUT some complete, dumb airhead. She’s apparently stretching herself and trying to do something positive with her life, possibly inspired by Superboy or making up for something (I honestly don’t know what her motivation is, but as a "supporting character" in the Superboy comic, that would be a simple guess, I suppose). Though I don’t have much context for things, the fact I recognize most of the characters does a lot for me, and allows me to enjoy the issue in and of itself, and I wonder at stuff between Superboy and Knockout, as well as between Superboy and Tana…and my curiosity has me that much more curious about the early issues of the series, in a good way! Visually, I love Grummett‘s art…all the characters look familiar, and look good (as far as they’re supposed to…Rex has the slightly smarmy look to go with his name, as well as with my memory of his actions during Reign of the Supermen and claiming legal right to use of the name ‘Superman’). Superboy especially looks exactly as I "remember" him looking in this time period, which is what I expect and adds to my enjoying the issue. Though I enjoyed the issue, it does not seem at all "essential" in any way to Underworld Unleashed…without "prior knowledge" OF that title as a concept/event series, I wouldn’t even know from this issue what it actually is! 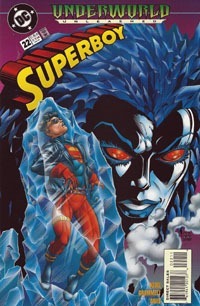 In context of this issue, Neron could be just some villain playing behind the scenes of this title, and even the Underworld Unleashed logo on the cover could be a blurb for this issue or a story in this series following whatever the Legion/Legionnaires crossover was, with an underworld being unleashed on Superboy and his allies. 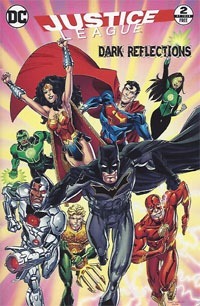 If you want the entire event/crossover, though, since the logo’s here on the issue, you’ll want this for that at least. Otherwise, this issue doesn’t seem to be particularly significant in and of itself in isolation–I’ve not read the aforementioned Legion crossover, I don’t recall what came immediately after this issue, so I’m not sure how significant Roxy and the police exam might truly be, or Knockout’s presence in this issue, and so on. 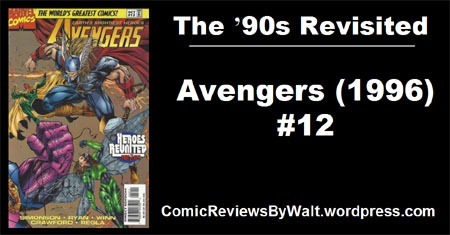 As a snapshot of mid-’90s Superboy by Kesel and Grummett, though, this is well worth snagging if you find it in a bargain bin…but probably not something to singularly seek out without it being part of a run or as seeking Underworld Unleashed tie-ins. 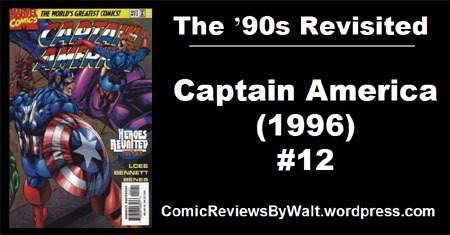 Here we are with Captain America #12. An "anniversary" issue, double-sized (and extra-priced for its time), yet it is "only" $2.99…cheaper than something HALF its size even twenty years later. This is chapter 4 of the 4-part Heroes Reunited arc that spanned Fantastic Four (1996) #12, Avengers (1996) #12, Iron Man (1996) #12, and this issue. We open on Rikki Barnes–a girl that’s apparently been Cap’s partner of late, a new "Bucky"–as she discovers a mess of a break-in at her grandparents’ house. This turns out to be Dr. Doom, who goes on about her being some chronal anomaly that shouldn’t exist. Captain America arrives and saves her, confronting Doom, as things start to come out. The Fantastic Four are currently battling Terrax in Central Park (presumably from where Fantastic Four (1996) #11 had left off…or one of the #11s); there are other heralds as well, and the FF WILL perish. Doom has already seen the Earth destroyed three times, and now his time-travel device is damaged and can’t be counted on for a fourth trip. Galactus prepares to consume the Earth after his heralds soften things up a bit…and only by trusting Doom and the information he brings to the table can the heroes hope to prevail. While the "Knights of the Atomic Round Table" work on a solution and build on Banner’s idea that they find a way to "overload" Galactus, Rikki ponders her place and the personal idea of how she’s not supposed to even exist. The Silver Surfer arrives and tries to get her to convince the others to evacuate what people they CAN from Earth before its destruction. When he flies off, she manages to grab his board; Cap gives chase and pleads with her to let go (mirroring what we know of his facing the original loss of Bucky in WWII). Galactus blasts her, apparently perturbed that a human would dare to touch the Surfer, and thus something that belongs to Galactus. Of course, this becomes some poignant bit that makes the whole thing PERSONAL for the heroes, prompting them to want all the more to take down Galactus (as if the entire WORLD being at stake wasn’t enough). So, too, does the Silver Surfer join in, seeing the injury of one human where he was ok with billions being not just injured–but killed. 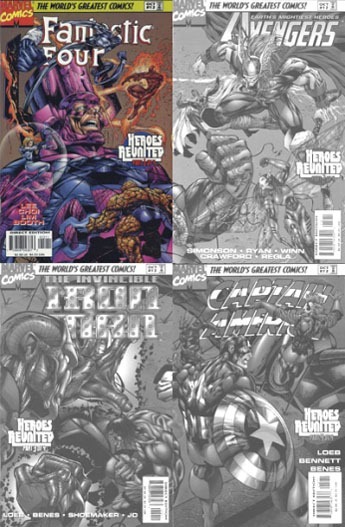 The Surfer becomes the key, bearing the heroes’ devices and artifacts, betraying Galactus, and though he dies, Galactus is destroyed as well. 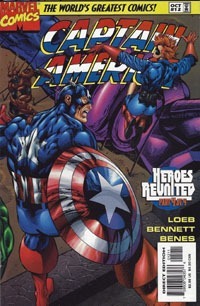 Doom refuses to stay with the heroes even in friendship; and a brief epilogue, Cap meets James Barnes and Peggy Carter Barnes, with Fury explaining that he knew them but can’t be told how/when…and as Cap prepares to take off, The Watcher talks about how all this has been only one of many tales of heroes reborn. I felt like more than the previous three chapters of this story, this one had a lot of "splash pages" and "double-page splashes" and such…a bit of a "cheat" regarding the page count, propping that up to a higher count but not really increasing the "value" of the amount of story contained in the pages. The art itself is quite good, and I enjoyed it…once again, despite multiple pencilers I didn’t notice any overt, clear shift from one to another…I simply read the issue, followed the story, and nothing wonky or weird jumped out screaming "this is a different visual style here from that last panel/page" or such. One can do a heckuva lot worse than to have Ed Benes art in an issue…and for my not noticing any stand-out difference, I’d have to say that at least here, the same goes for Joe Bennett. The cover is part of a 4-part image…something I’ve pointed out in the previous chapters’ write-ups; and something I far, far, FAR prefer to contemporary practices that would see something like this done all on one single issue, forcing one to buy 4 copies of just one issue to get the full image. Here, the buyer is rewarded: buy all 4 chapters of Heroes Reunited, get this bigger 4-piece image. Story-wise, this was a mixed issue for me. It felt a bit choppy and bigger on ideas while constrained by space: we have a bit of "subplot" of Rikki contemplating her existence just because a supervillain claims she shouldn’t exist…and there’s not much room for that to really be explored and all–for the character, for Cap, for anyone. For the story essentially picking back up with the Fantastic Four facing Terrax, it seems like we get to a resolution with Galactus being destroyed a little too easily and conveniently; though we have the "shorthand" of being able to just be SHOWN different heroes facing different heralds, and "assuming" that (if one’s read the previous three chapters of Heroes Reunited) we’ve already seen the action/details, we don’t have those details actually within this issue itself. It also hasn’t entirely felt like we’ve had any real focus on Doom gathering pieces of information through the previous chapters in a way to fit stuff…more like he gleaned a bit of extra info from SHIELD in the Iron Man issue and now put it to use (though we don’t really get clued in on the exact data). As a whole, though…this caps off the four part story with Doom bringing what’s needed after several failed attempts, that allows the heroes to destroy Galactus withOUT destroying Earth. We get a rather arbitrary/sudden turn of the Silver Surfer for this being a new iteration of his seeing the heroes, rather than a continuation. But the issue ultimately stands somewhat alone; one gets context of what’s gone on, so you don’t NEED TO have read the previous chapters. You’ll just "get" more out of this issue if you have, and appreciate the overall story a bit more, I think. I guess I feel like this is like far too many epic stories: the setup in the first chapter can be great and full of potential…but fails ultimately to live up to the potential in MY mind. That we get an epic story on this scale in only 4 issues (though they’re the size of 8 regular-sized issues) with no other tie-ins and such is something that would be completely "impossible" today, and so even a "choppy" issue is preferable to avoid umpteen tie-ins and expanded chapters and such. I’d bought this originally when it was a brand-new issue; but the copy I read this time is one I got from a quarter-bin; and certainly is well worth the 25 cents if only for the amount of time it took to just READ the issue (even WITH double-page splashes!). And to get all 4 issues of this Heroes Reunited arc for $1, for the reading experience, I definitely enjoyed this stuff…maybe a little more for the art than story, but I hadn’t realized quite how much this story had stuck with me, of seeing the heroes lose–die–multiple times before achieving victory. There were 13th issues for all four series, as another 4-part story, with the Marvel characters and this Heroes Reborn universe merged with the then-Wildstorm Universe; and then there was the 4-issue Heroes Return mini-series that bridged the characters from these series back to new series in the main/actual Marvel Universe. This felt like the most "standalone" issue of this 4-parter so far, and felt a lot more tied to previous issues than the other chapters. This issue has several references to the previous issue, beyond simply THAT a conflict had begun or stuff come before. We open on Tony Stark being brought into a meeting involving The Fantastic Four and the "Hulkbusters." As he gets up to speed on the overall situation, a fight breaks out between the Thing and Hulk, eventually interrupted by Invisible Woman separating them in invisible force-shield bubbles. Cosmic readings are picked up, and the group finds several entities headed to Earth. Tony cuts out–leading the others to think maybe he hasn’t changed as much as thought…but we find that he’s actually checking in on Happy and Pepper–actually caring about others beyond himself. The FF went into action against the heralds of Galactus while Tony’s (separately) kidnapped from Happy’s hospital room by Dr. Doom…while Pepper frets over this, Happy seems fine, figuring it’ll all be resolved within the day. 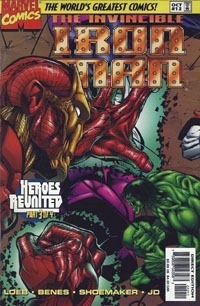 Doom takes Stark to the Helicarrier; meanwhile, Liz gets past security and interacts with Hulk–who reverts to Banner. 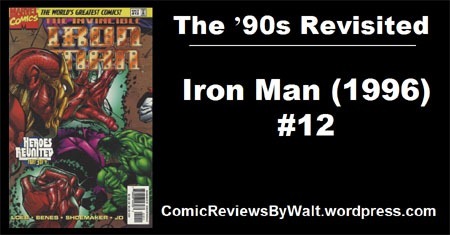 On the Helicarrier, Stark suits up as Iron Man and confronts Doom before they’re joined by Fury, who lays things out before assembling other heroes, and breaking the news that the Fantastic Four have been (by then) killed in action. The remaining heroes head out to make true their name as "Avengers" and engage the heralds in battle, before Hulk and Iron Man attempt to take on Galactus himself. As he sees them fail, Doom activates his device, and armed with the new knowledge of this latest go-round, disappears back in time for another attempt at stopping Earth’s destruction. As said, this issue feels the least connected to the overall story/pattern. Doom is there, and we have reference to stuff, but that’s almost incidental. This feels like it probably could read pretty well without the first two chapters, and only earlier issues of this very series (Iron Man) for context. I both like that and yet don’t at the same time. The story title of the issue and the title/credits page don’t even have any reference to Heroes Reunited, unlike the first two chapters; almost like this story was written with a few story-beats required but otherwise completely independent of the overall 4-parter. With the art, there are multiple pencilers…but that again didn’t bother me as nothing really seemed to jump out at me or have any jarring differences in appearances. Simply reading the issue, I’d only know there were multiple pencilers because of looking at the credits. I’m a reader-first, so when the art is at least "similar" enough that I don’t really notice it change–that is a good thing. I suspect at least part of that is also due to the consistent inks, colors, and lettering; perhaps heavier handed inking and no huge variation of colors can well hide the different pencils. All that said, I enjoyed the art on this issue! I don’t know how I’ve gone all these years without noticing it, and I didn’t notice it on the interiors, but the EAR on Iron Man on the cover just looks extremely odd and "off" to me and is really the only thing that totally "threw" me off with the visuals. Also as said with the previous two chapters, I’m quite glad the cover can work as it does on its own, yet is part of a 4-part image; as opposed to any one of the chapters having 3 extra variant covers to make up the singular image. Get all four chapters of this four-chapter story and have 1 full image; get any single issues and you have a cover that has the characters in the issue and can be its own thing. As with the Fantastic Four and Avengers issues of this story, this works well enough as a one-off issue…it’d be worth getting even by itself if you found it for 25-50 cents or so; even up to $1ish. Any more than $1-$2 and I’d recommend definitely getting it as part of a set of the four issues of Heroes Reunited. Despite working alone, I’d recommend this more as part of a set for the "experience." I’m glad to have read it, and somewhat surprised at the details I remembered from whenever the last time I read this was–possibly only back in 1997! Heroes Reunited part 2 of 4: Shadow’s End! After reading Fantastic Four #12, I was thinking I remembered this story/event being a bit more formulaic, but apparently I misremembered. 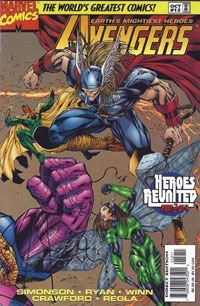 This issue opens with Thor performing funeral rites over "Thor 2," who has died in battle. Back on the Helicarrier, a blast is delivered that obliterates the body…a Viking Funeral! Before things can go back to normal, a pilot Fury had sent out returns with a dire warning of Galactus…just before Dr. Doom shows up with his own tale of Earth’s destruction and how the heralds of Galactus must be destroyed at once and their devices disabled. The heroes spring into action, targeting Galactus’ devices. The Fantastic Four battles the Silver Surfer in Moscow even as Doom sets his own machinations into motion. Though the FF ultimately destroy the device, Doom’s unleashed a huge nuclear attack that obliterates all but the Silver Surfer. SHIELD takes heavy losses against Plasma, but with the sacrifice of the Helicarrier and Fury, that capacitor is destroyed. Meanwhile, Hank Pym has revealed a duplicate of the Vision that he’d had, leading to Pym, Scarlet Witch, and the Vision joining the Hulk in the Antarctic. They face the fury of Firest… FireLORD. Victory again comes with a high price. In Hong Kong, more heroes take on Terrax…again with losses, ultimately destroying another capacitor. Doom intends to nuke New York City to take out Galactus himself…but a failure to launch seals the planet’s doom (with the immediate destruction of most of the former Soviet Union in one blast). Through all these deaths, the Silver Surfer has observed the selfless sacrifices and acts of love, coming to realize he can’t stand by. He joins with the remaining heroes as they unleash a final, desperate gambit to destroy Galactus, even as they know their own lives and the entre Earth are forfeit. Doom makes his escape once more as the Earth dies, taking Galactus and the solar system with it (leaving only Mjolnir floating in empty space). I had a few problems with plot points through this issue… For once thing, I’d thought Terrax had already been on Earth and fought the Fantastic Four in New York, rather than his going to Hong Kong. I suppose Doom’s time-shenanigans changed that, if he arrived prior to Terrax’s original descent. And at the end, it seemed like the heroes "conveniently" just "gave up" and were quick to unleash the gamma energy that destroyed the solar system, to take out Galactus. While I "get" the notion of them making this ultimate sacrifice to stop Galactus, so that untold millions of OTHER worlds might be spared…it just seemed so quick and no one even arguing at the fact that they were basically THEMSELVES triggering the destruction of the Earth on the premise that Galactus was just going to destroy it anyway. By this logic, why bother fighting Thanos, if everyone’s gonna just die (eventually) ANYway, might as well kill the entire universe so that Thanos doesn’t go about doing it piecemeal. Story-wise on the whole, this is not a horrible issue. It moves at a quick pace, jumping all over to cover a lot of ground. As with the FF issue, this issue by itself could easily be stretched out into an entire mini-series, or at least multiple issues. (Heck, for Heroes Reunited, these days each issue would be split into 3-4 issues/minis/arcs and drag out 12-16 months!) Reading this just as the next chapter, it’s ok, though I’m interested to get to the other issues of this arc. This picking up on stuff from #11, with nothing else even alluding (to the reader) about the events of FF #12, this seems like a poor (or just very, very dark!) ending to Avengers. Art-wise, despite the multiple creatives involved, I didn’t really notice differences specifically as I read through the issue…which is a good thing, to me! If I can "know" there are different artists and yet nothing jumps out at me as "Hey! This looks different…oh, here’s where the art was split!" then I tend to be happy with it. I enjoyed the art throughout this issue–particularly the look(s?) for Dr. Doom himself. I definitely like that the cover is part of a singular larger image, yet works well enough by itself. Certainly beats modern comics where the 4-part image would have been variants for the same issue, and maybe "gated" or "chase" variants at that! Other than context for Doom’s commenting about having already witnessed the world ending and knowing a bit about him (having) a time travel device, this issue pretty much stands alone–it’s better to be read in order after the FF #12 issue, but being read solely in following the Avengers title, it seems like it must’ve held up pretty well to that overall story. Found in a bargain bin ($1 or under) this would be worthwhile, or if you’re getting all of the Heroes Reborn Avengers issues. I wouldn’t recommend this for more than $1 by itself; but it’s definitely worth getting if you can get it as part of a set of all 4 issues of Heroes Reunited! Heroes Reunited part 1 of 4: Doomsday! It’s probably been a good 20 years since I last read this story, but as I’ve yet to actually do a solid read-through of the entirety of the HEROES Heroes Reborn thing, so the sense of familiarity I had in the reading was a very welcome thing. 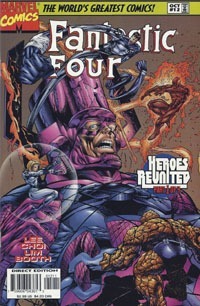 The cover itself hit me with all sorts of deja vu…and seems like something that in some ways could qualify as a favorite or “iconic” cover…at least because hey–you have the Fantastic Four in full-on attack mode against a distressed Galactus, who is quite recognizable as the giant purple Kirby-entity that he is. I’d actually forgotten until looking at the other issues in this 4-part epic that the cover joins with the other 4 chapters to forma larger 4-part image. Which, of course, would virtually never happen today, 20-some years later, when any potential for such things absolutely MUST be used all on the same exact issue as variant covers, instead of a fun “bonus” or “reward” of getting one copy of an entire story! After the front cover itself, the next thing to immediately grab my attention was the fold-out nature of the cover. This is from a brief period when Marvel utilized the cover to provide both a page giving the premise of the title and a list of core characters and another page to recap what’s come before as one heads into the issue. Though Marvel has since gone through other things and seems to primarily at present do a “page” with this sort of info as just a text piece, I can definitely say I’d prefer this overall…at least by comparison. In a way, this issue is rather simple, despite its extra length that allows quite a bit of detail to unfold. Dr. Doom returns to New York, and the final piece of a device he’s been working on is finally in reach. Meanwhile, the Fantastic Four continue a standoff with the heralds of Galactus, before their master summons them away, and the FF are picked up by SHIELD. Nick Fury has also gathered Iron Man and Captain America–Avengers–as things are bigger than they appeared. Probes that had been launched earlier penetrate Galactus’ space and reveal his ship, and the release of devices to several points on Earth. This leads to the various heroes splitting off, each to attend to the building situation in different places. Johnny Storm–the Human Torch–goes to the Himalayans with the Inhumans to face Firelord and one squad of Avengers goes to Monster Island to face Plasma (and by extension of being on Monster Island, the Mole Man). The fight with Firelord winds up falling to Black Bolt, who is able to destroy the device, but its energy emission on destruction kills the Inhumans and Human Torch. Meanwhile, Namor sacrifices himself to neutralize the device guarded by Plasma. As the fight moves to Galactus himself, now on Earth, the SHIELD Helicarrier is compromised…and after it’s evacuated, Nick Fury and the Countess steer it into Galactus’ ship, giving their lives. Unfortunately, Galactus survives. In the ongoing battle, we get surprising twists and turns…and deaths. The Thing and Black Panther are killed, and as the situation deteriorates further, Doom enters the fray, determined to gain the Power Cosmic for himself…and his interference screws things up further for the heroes. As Reed appeals to Doom’s better side, it becomes apparent that the situation is hopeless. As the world dies, Doom alone escapes via his device. This issue alone would in present-day terms be an entire event in itself, at least for the most part. I know where things go, and why this is “only” part 1 despite the deaths and then destruction of Earth itself. The extra size to the issue, with plenty of dialogue and captions and such certainly gives us more in a single issue than we’d likely feel we got in an entire event in the present. The story seems to mostly be its own thing…there are “moments” and plenty of references that would probably mean more to me if I’d read the previous few issues, or the entire series so far; but I felt comfortable jumping in here and just seeing characters behaving largely to form, regardless of their depth. The art is excellent–for the most part, I felt like Lim and Booth gave some of my favorite appearances to characters throughout the issue. Overall I didn’t notice much of a change between the two…the only point I really felt like I noticed an actual/major difference is in one panel having a large, majestic Captain America, and then another panel with him looking maybe half the size and pretty much TOO “lean.” The entire visual team seemed to work quite well together here, at least in my reading: I enjoyed that this did not feel like it had multiple teams on it. 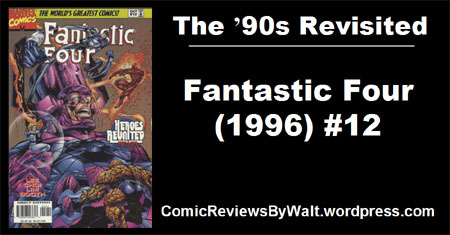 As series go, this is “functionally” the last issue of this version of the Fantastic Four. There is a 13th issue, but due to its crossover with the then-part-of-Image Wildstorm universe prior to Wildstorm‘s being bought by DC Comics, that issue has not (to my knowledge) been reprinted or the story “acknowledged” in-continuity/etc…making it a sort of one-shot and curiosity. While I’d initially checked out the first issues (as of this writing, I honestly don’t recall if I’d followed the next few issues of FF or not but recall #7 or so for sure) I was quite a bit “behind” by the time of this crossover. I imagine that I was aware of things coming up, thanks presumably to Wizard Magazine, which was probably part of my getting this story as the issues came out…gearing up for the end of Heroes Reborn and the return of the characters to the main Marvel universe. This issue more or less works on its own, though it ends on quite the bad note if read in isolation. If you can find all four of the #12s for Heroes Reunited, though, they make quite a set, and just from this first chapter, I’m eager to get into the rest. Assoc. Editor: Tom Palmer, Jr. I don’t know where this story takes place in continuity exactly (or even whether or not it IS in-continuity). But thankfully, that doesn’t really seem to matter. 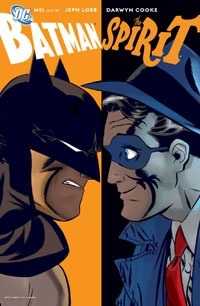 Essentially, we get a story opened by the meeting between Gordon and Dolan, and their discussion leads into us (as the readers) discovering the story of “How the Spirit met Batman…” The story itself doesn’t seem particularly deep, and actually evokes a classic Silver-age feel, when events were just taken at face-value, simplistic, silly, and new as they might be. A bunch of Batman’s rogues and a bunch of the Spirit’s rogues get together; and it’s up to Batman and the Spirit to foil the baddies’ plans. While things are going on, the vigilantes’ confidantes are each ‘seduced,’ and play their own role in the story’s ending. I know next to nothing about The Spirit as a character. I know that he was created by Will Eisner, and something about the creator adding the mask to please someone with a say over the character being published or not (someone correct me if I’m wrong). The character’s identity, supporting cast, rogues, adventures, and in-continuity history are a mystery to me. Batman, on the other hand, I do know. One might expect that to detract from the story, but it doesn’t. I got the feeling that a lot of characters were almost analogues of one another, in the way that one could compare Green Arrow and Hawkeye, Aquaman and Namor, and so on. Given that, you need only really know one side or the other to “get” the most basic concept of characters, and have at least some idea of what they’re all about. The art seems at points almost overly-simplistic at first glance, but that (like the story itself) lends beautifully to a “classic” feel. 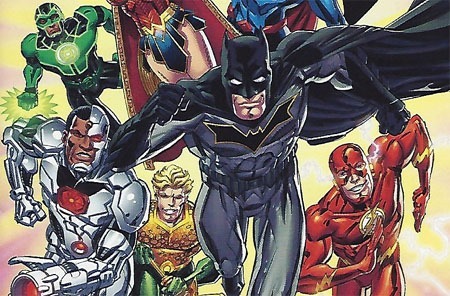 Additionally, upon slightly deeper examination, it reminds me of the “Animated DCU” visually, which lends further enjoyment and timelessness to this story. Overall, the issue reads rather like an extra-length episode of Batman: The Animated Series…and for me, at least, that is far from a bad thing. Possibly the worst thing about this issue is the price. I looked past the price due to the novelty of these two characters being thrust together and wonder at how (or even if) this will have any play in the new The Spirit ongoing. Was it worth it? Yeah…I’d say so. This is a fun read, not so completely hokey as to make one check the date in the indicia, but by no means as serious-toned as a lot of other recent stuff coming out of DC. I can’t speak to longtime/familiar fans of the Spirit, but just for knowing the Batman-side of things, this seems like quite the enjoyable, faithful sort of mushing together of two characters who’ve never (to my knowledge) met prior.